The variety of women's hats delights: evening, cocktail, hat, cylinder hat with a wide brim, a simple straw model. So forgotten accessory is once again gaining its popularity. Probably, in your wardrobe you have a few dusty copies. 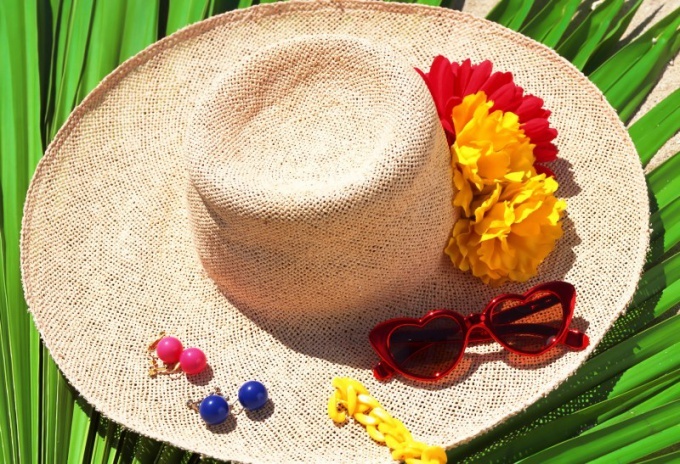 You have a great opportunity to upgrade your hat, give her a second chance and enjoy the new clothes. Headdress, decorated with their own hands, will be the subject of your pride. - glue gun and glue. Take a wide satin ribbon in black. Wrap it twice the base of the hat, tie a knot and hide the ends under the braid. The alternative is to tie a bow small size from the back of the headdress, and leave the ends of the tape freely falling from the brim of a cap. The edges of the tape while carefully singe with a lighter to the thread does not crumble and not be dismissed. Zadekorirovat the hat using glitter or glossy nail Polish. In the first case, apply on field hats rubber adhesive drip method and pin sequins on it in black. You can create separate elements, divorce or post a picture. If you have varnish, you can apply the product figure, very carefully, using a simple brush for painting. Imagine that your hat is the leopard skin, to determine the size of the spots and evenly apply nail Polish on free sites, giving tassel a required shape. After that, let the hat to dry completely. 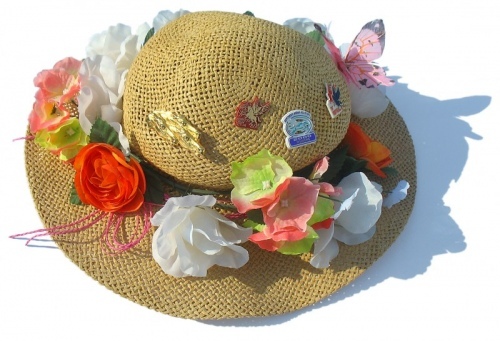 Summer hat can be decorated with artificial flowers, butterflies, shells, or big beads. Mount the decor in any form, if you use rubber glue or fishing line. Otherwise, when the product is already provided with a strip or border of a fabric, it is better to decorate the model already placed accents. For example, small shells or freshwater pearls it is better to strengthen the line of the edging, and three-dimensional butterflies or large flowers to primitivity to a satin ribbon or braid. Hat small size is easy to decorate bowknot with flower on one side. Tie the ribbon in the center will secure a bright décor, for example, lilies Bud, rose or poppy,and carefully baste the bow to the base of the headdress. In lieu of flowers can use the rhinestones or beads large teardrop shape. Children's headdress zadekorirovat lace. Take a piece of fine lace delicate tones, preberite its mono-thread, then baste the edge of the brim of a cap. If the density of the netting material from which made the headpiece, hold the pressure foot sewing machine, then you can pristroit lace around the loop without tightening the thread. Models of autumn and spring collections of hats boldly decorate with felt and fur. 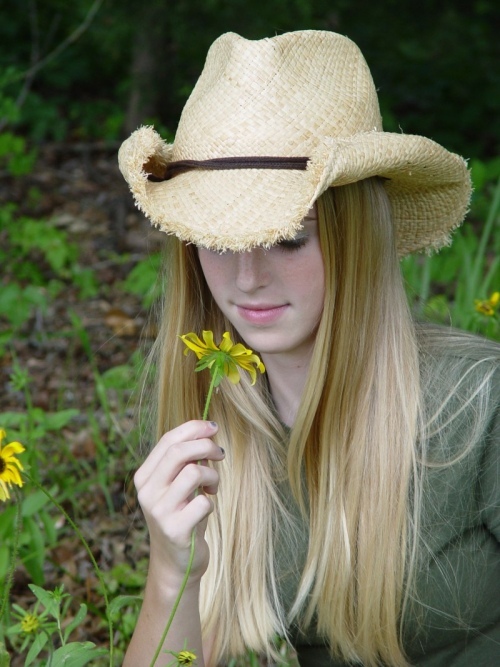 Pick up the pieces of fur and felt in tone to the material of the hat. Cut out cardboard template of a leaf with serrated edges, attach it to the felt and draw around it with chalk a few details. Make the workpiece, in addition to leaves you will need a few strips of width 0.5 cm and length of about 8-10 cm. Stationery knife to cut the leaves of the slot and the notch, to be able to give details of the volume. Complete the application with one side of the hat. With the help of glue gun and glue, attach the leaves on the surface of the product. Mounting points are two: the base sheet and the edge of the sheet. Sticking the tips of the leaves, thebyte them or to the right or to the left,thus, parts will become convex. With a knife cut thin strips of fur, for example, seals. Take a felt strip on one edge of the drip the glue and press it into place, the tip of the strip of fur. Then wrap the fur around the felt base to the edges of the skin were joined together. The end of the winding is also secure with glue. You should now have several strips, half, or third of which are decorated with fur. These bars attach near the base of the leaves or on top of those, too, by bending the parts in hand. If the thickness of the felt bands is not large, they can string large beads. 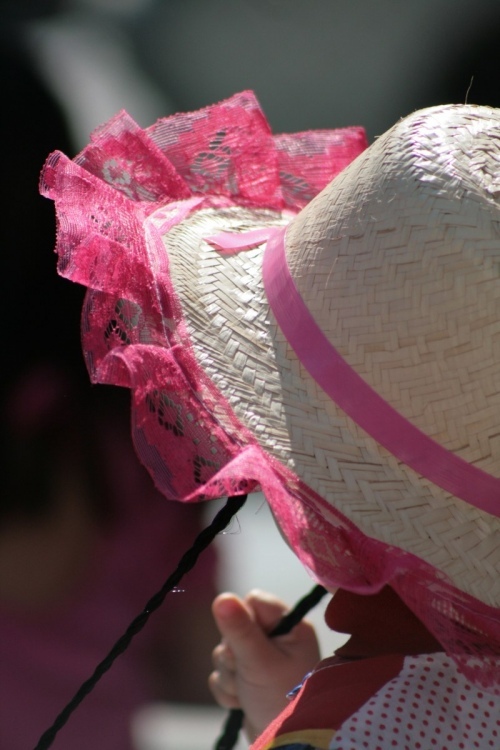 For the decoration of hats, you can also use feathers, brooches and chiffon pieces of fabric.